Many of us can still recall the haunting images that flooded the news from the 1995 bombing of the Alfred P. Murrah Federal Building in downtown Oklahoma City. These included the Pulitzer Prize winning photo of an Oklahoma firefighter emerging from the rubble with a tiny dying infant. Images such as this and reports from this horrible act left us all in overwhelming anguish. Today, one particular image from the tragedy stands as a symbol of hope. 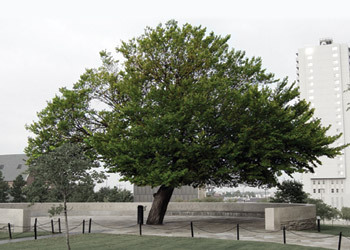 An American elm sits on the north side of the Oklahoma National Memorial in downtown Oklahoma City. Before the bombing, this lonesome tree was the only shade tree in the parking lot across the street from the Murrah Building. Employees came into work early to get one of the shady parking spots provided by its branches. Remarkably, photos of Oklahoma City taken around the time of statehood in 1907 show this same tree. This would mean the tree is at least 105 years old! Despite its age, the tree was taken for granted and neglected prior to the bombing. The force of the blast on April 19, 1995 ripped most of the branches from this tree, and glass and debris were deeply embedded in its trunk. Fire from the vehicles parked beneath it blackened what was left of the tree. In addition, the tree was nearly chopped down during the initial bombing investigation. Evidence hanging in its branches and embedded in its bark needed to be recovered. Most expected the tree to wither away. However, almost a year after the bombing, family members, survivors and rescue workers gathered for a memorial ceremony under the damaged tree. They noticed it was beginning to bloom again! Against all odds, the tree ultimately survived. The tree now thrives primarily as a result of specifications set by the Oklahoma Memorial design. These included a mandate to prominently feature and protect the Survivor Tree. Asphalt had bowed up onto the tree, and workers had to jack-hammer the asphalt away without doing further damage to the tree. The compacted red clay underneath the asphalt was then broken up with picks and shovels, again to prevent further damage. Truckloads of organic mulch were added. Dedicated workers gave a major root of this tree it's own little tunnel to grow and expand, rather than cutting it. distributed each year on the anniversary of the bombing. Thousands of Survivor Trees are growing today in public and private places all over the United States. For example, did you know saplings were sent to Columbine High School after the massacre there? Some were also sent to New York City mayor Rudolph Giuliani after the September 11, 2001 attacks, as well as the Virginia Tech massacre in 2007, and various other times. Think about it: this tree was literally burned, chopped, broken, and torn apart in 1995. One whole side of the tree was gone. It was basically a v-shape with only two branches and nothing else. It’s once shade-bearing branches were crumbled and trampled in that parking lot and bark was stripped and gutted from its body. Regardless, it not only stands stronger than ever today, but it is an active symbol of hope to Oklahomans, Americans and those stricken with adversity. The inscription around the inside of the deck wall around the Survivor tree reads: "The spirit of this city and this nation will not be defeated; our deeply rooted faith sustains us." Eighteen years removed from the bombing, resilient Oklahomans continue to honor those who were killed, those who survived and those changed forever by this tragedy so close to home. Today, the forces of fear and hate from that day are continually beaten down by the power of compassion and hope. 168 banners line the Oklahoma City Memorial Marathon course  one for each victim of the bombing. When you run past those banners April 28, remember the gift of life. Remember that it is too precious to waste. And most importantly, be like the American elm  spread the seed of hope.